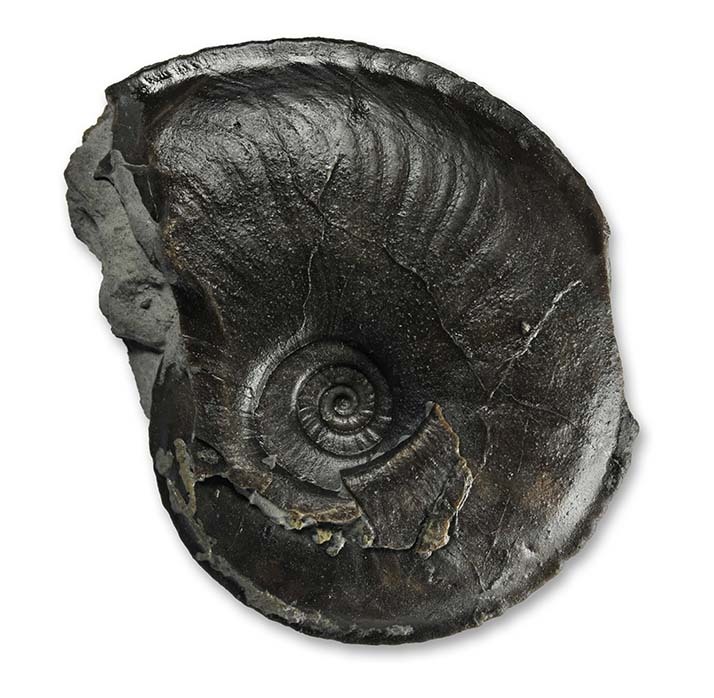 This wee little 1.4 cm diameter ammonite that came off an eBay auction is a big rarity both in terms of species and in terms of where it was found : Port Mulgrave. The species isthe ultra-rare Phymatoceras rude (hurray, another species from my “wants list” down ! ), and it usually comes from the striatulum subzone of the upper lias, the Peak Mudstone member at Ravenscar, where the beds were protected by the downthrow of the Peak Fault from the erosion that everywhere else at the end of the upper toarcian eroded a lot of the uppermost toarcian. Now wait, you will say, if these beds were eroded everywhere else, then how come this ammonite can be found at Port Mulgrave ? 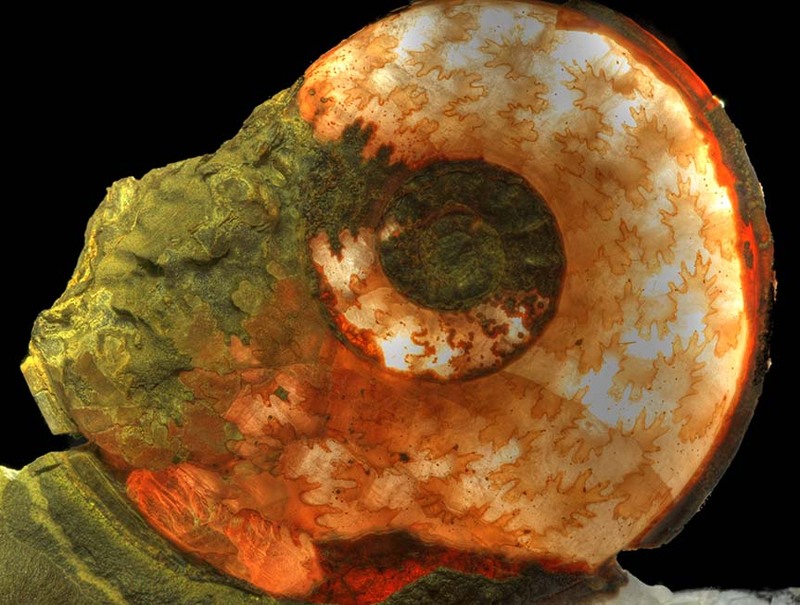 When you look closely at the ammonite, you see a rusty brown sandy substance in the umbilicus. 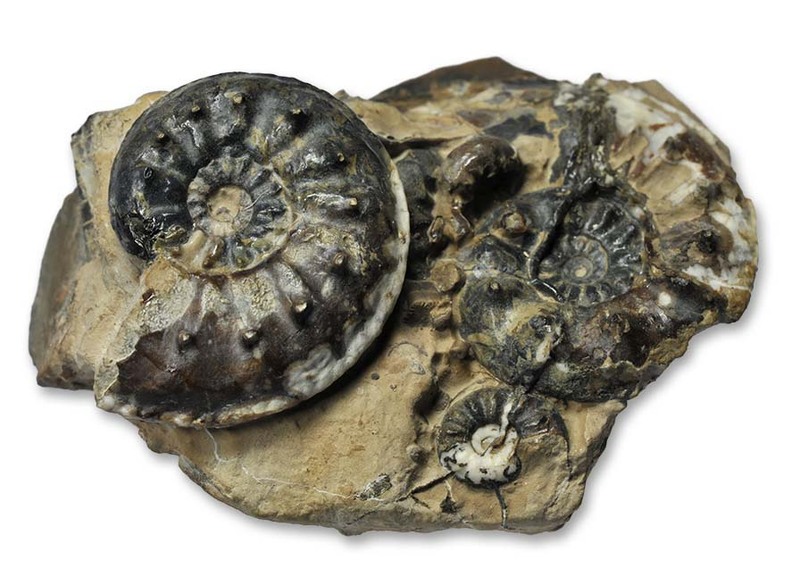 I think this is middle jurassic sandstone, and that the ammonite was naturally eroded from the striatulum subzone and then re-bedded when the aalenian sandstone was sedimented. I have seen small badly eroded fragments of ammonites in these sandstones before, but never a recognizable ammonite. I like theory 1 best, what do you think ? P.S. 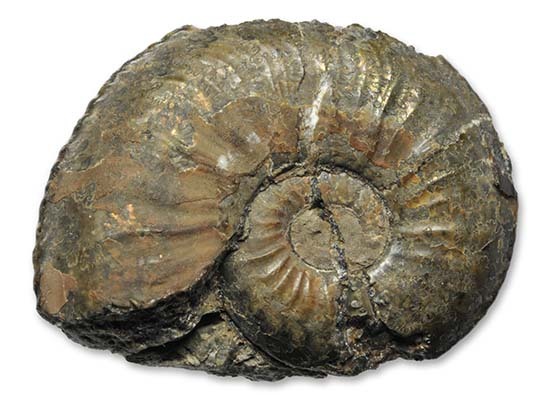 : If you are the seller of this ammonite : I know you might think that the sales price was a little low now that you´ve read this. Console yourself with the tought that you´ve earned yourself a copy of the book once it´s ready ! A large aalenian sandstone block with a re-bedded layer of toarcian pebbles, including what looks like a rounded fragment of an upper toarcian Grammoceras ! I’ve looked at many of these blocks during my last collection trip and almost every one of them showed some ammonite fragments ! I photographed it against the light on my light table and pulled up the contrast in Photoshop to maximum to show the most of the translucent chambers. With this one I did a little HDR setup, photographing it with a number of exposure settings and combined the pictures with a software later to capture the maximum dynamic range. Of course beside the right preservation you also have to prep the ammonite completely free of matrix to see the light shine through – with the two examples shown I was lucky with the Psiloceras, it “jumped” off a multi block matrix free, the Eleganticeras was a lot more work involving air pen, diamond cutter and air abrader to remove all the matrix surrounding it without braking the fragile calcite inner mould. 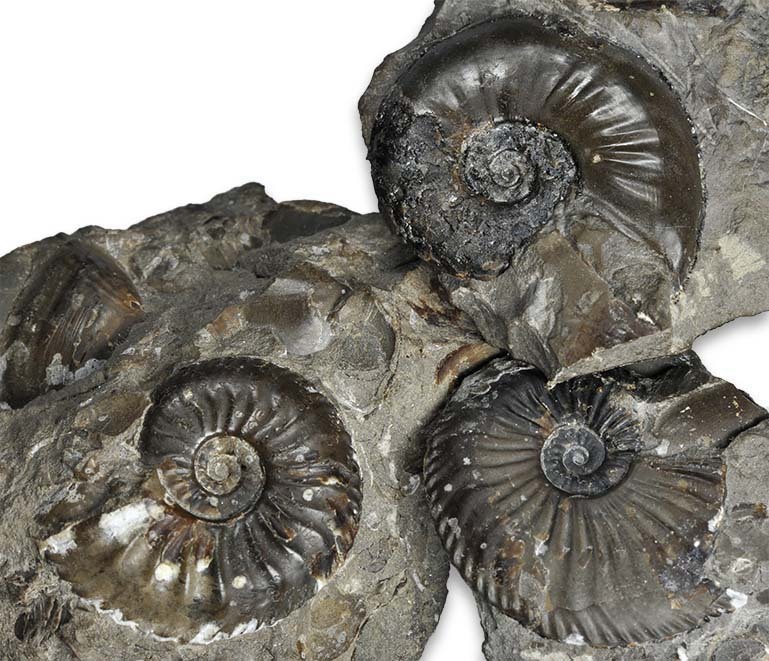 What do you do if you think you have one of the ammonites on the list ? Simple : Post a comment in the specific post (you have to leave your e-mail address but noone else but me can see it) and I will contact you ! So here´s the upper lias list : Some of these are real rarities, some may not even occur in Yorkshire, but please surprise me ! 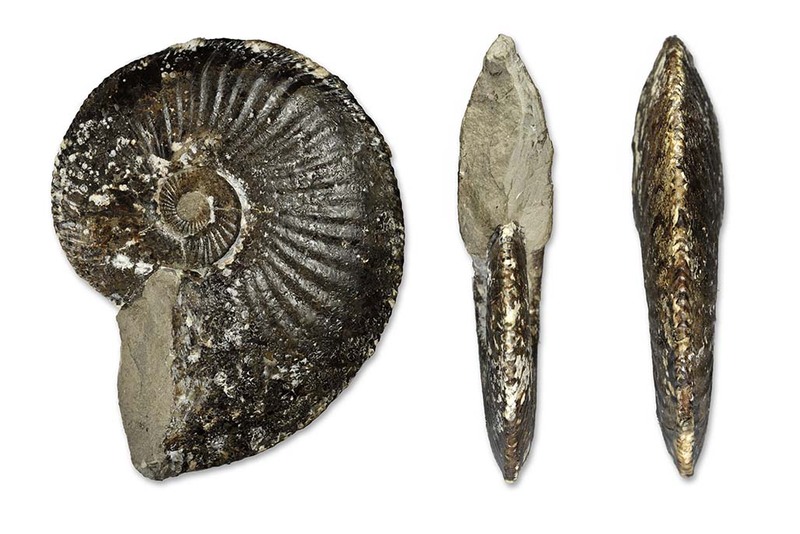 Phymatoceras rude (SIMPSON, 1843) – found on eBay, see post “Rare and re-bedded” ! Some of these are real rarities, some may not even occur in Yorkshire, but please surprise me ! 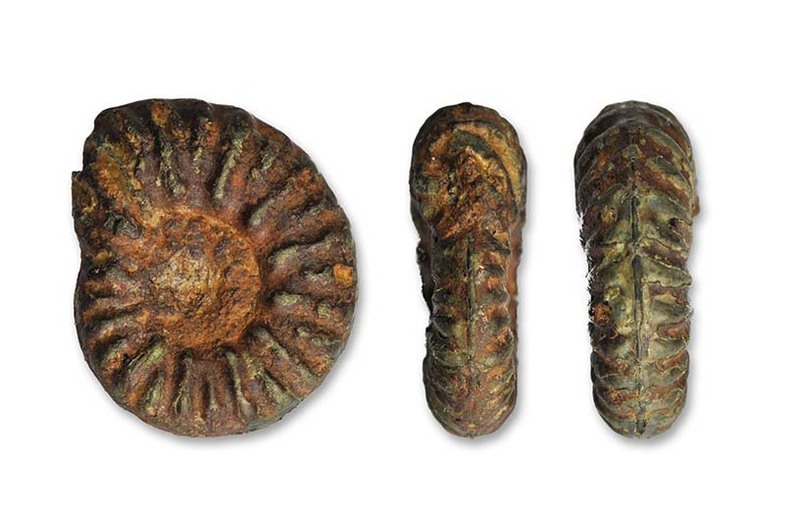 The next three posts will be quite dull – no pictures, just lists of ammonites I´m looking for to photograph for the book. The first post is the lower lias one. Bear with me if the list is not completely perfect – I´m still sorting through it to weed out the ones that are synonyms, have only ever been found or pictured once, etc. If you have any information to that effect, please also let me know ! 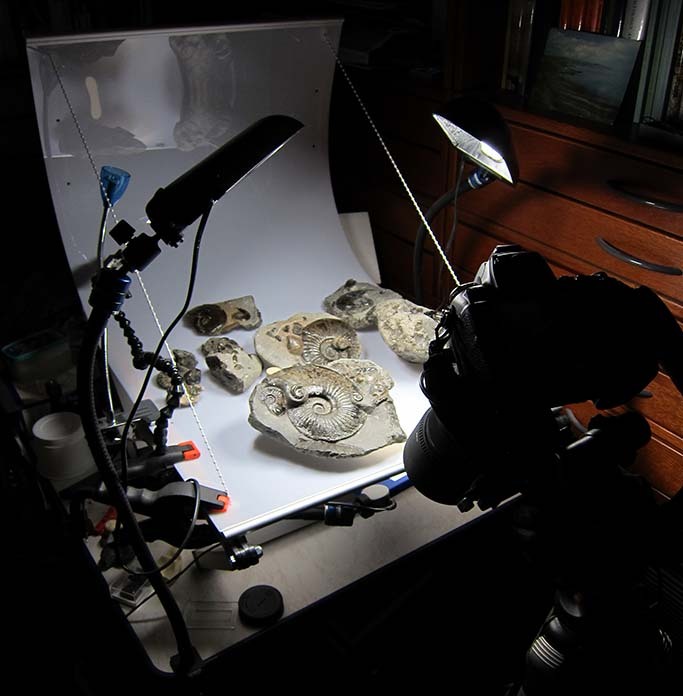 As you can see, this is my little studio where I photograph the fossils, with the “ensemble” of the Amaltheidae post still present. It´s just a little Novoflex macro table, that I´ve put onto another table to reach comfortable working height. There are 2 flexible lamps with 5400 °K permanent light from above and another from below the slightly transparent table to provide a little contour light from below. There´s another led spot clamped to the table if I need it for a special spotlight etc. In front of the table I have positioned a sturdy tripod with a 3D geared head that holds the camera with a 150 mm macro lens which gets me to 1:1 size if I need to. The geared head makes precisely framing the shot very easy, I find it a lot more suited to the task than a normal ball head. Depending on the size of the fossil I photograph, I move the tripod closer or further away from the table – the maximum size fossil I can do with this kit is about 30 x 30 cm. If I photograph fossils for any post I´m planning, I will always do a lot more pictures than you actually get to see in the post. One reason is that I obviously do several different photos where I vary lighting, sharpness points, positioning of the fossil etc to get the best shot possible. The other reason of course is that I do not photograph only for the post – there are a lot more detail photos and shots of additional fossils that I get to be used later for the book ! 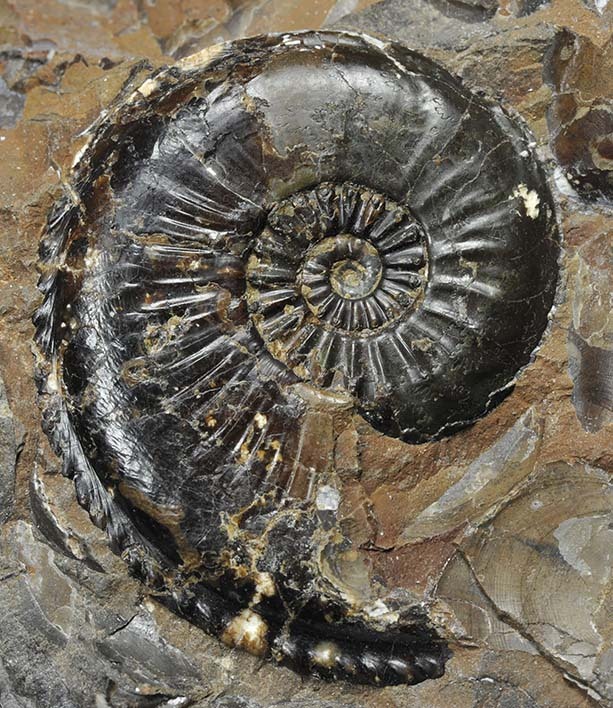 I normally research the ammonites I´m planning to write about first, so the text usually comes before the pictures. For writing the text I use a software called Evernote (it´s a free editor that saves the texts etc in the cloud) – It allows me to continue writing on my texts even if I´m not at home or not at my main computer. 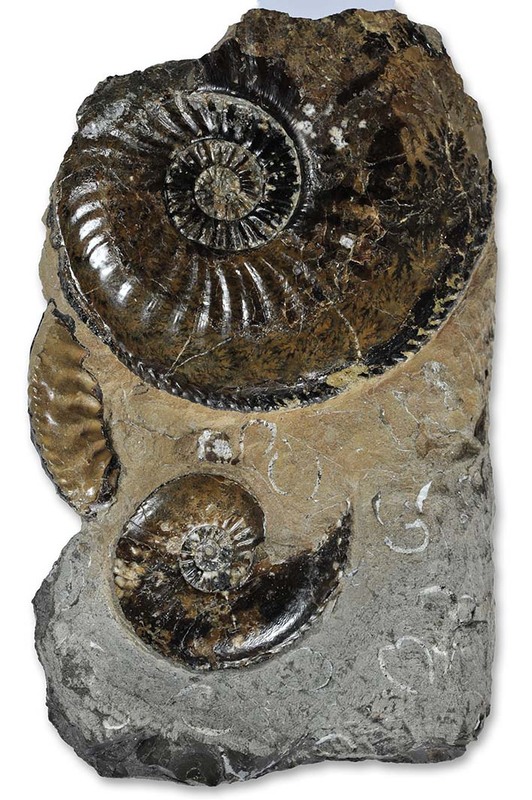 Once the text is about ready, I select the fossils from my collection and do a photo session. Today´s photo session for the Amaltheidae took about 5 hours (while outside a thunderstorm with torrential rain & hail was going on…). As the thunderstorm subsided, I switched my computer back on and began editing the photos. I run the pictures through a software called DXO first – it does a lot of automatic corrections for colour, white balance, sharpness, lens distortion etc for me. After that is done I do the masking, cropping and combining of pictures in Adobe Photoshop. If the picture will get used in the book I save it uncompressed for maximum quality in Photoshop´s own format so I can later use it without further problems in Adobe InDesign, the publishing software I´m going to use for the book. If it gets used in the blog as well, it will be re-sized for web use, marked with a copyright notice (If you like my pictures and would like to use them – contact me) and saved as a jpeg file, in a setting optimized for both size and visual quality of the picture. Once text and photos are complete, I upload the picture files to the WordPress media library, add any pictures comments and paste the text for the new post from Evernote into the WordPress editor. I then add the links to the pictures in the media library, do a final spell & visual check – and publish the post ! This workflow has worked quite well for me so far, I feel that writing the blog posts gives me an intermediate goal that continues to drive my work for the book. – thanks for reading, wherever you are ! It must be the beautiful braided keel that most of the members of the family Amaltheidae show that makes it a favourite amongst collectors. Amaltheus (Pseudoamaltheus) is supposed to occur in Yorkshire. 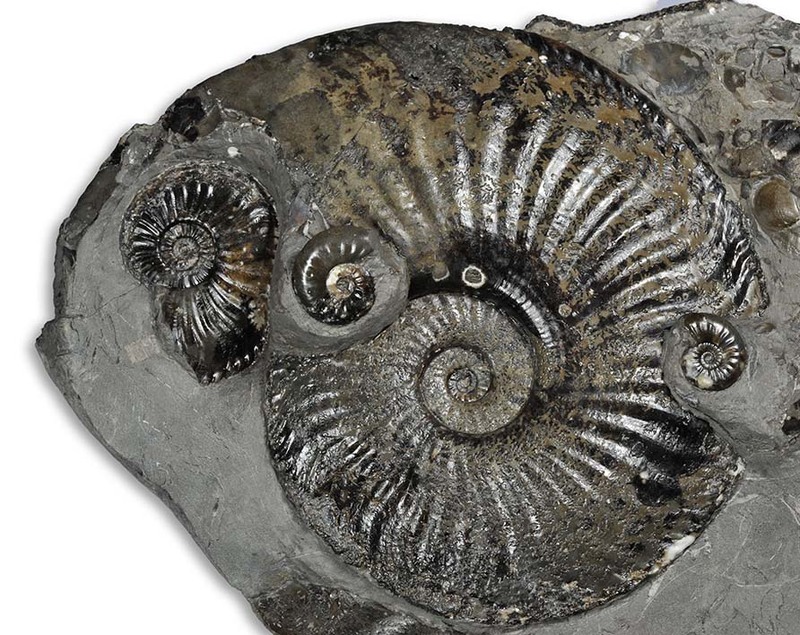 I think I´ve seen a badly preserved, flattened one on a crumbling block at Hawsker once, but I´m not sure since large Amaltheus margaritatus can also sometimes show sections with spiral ornamentation. But I´ve never seen one in a collection – If you have one from Yorkshire – let me know ! 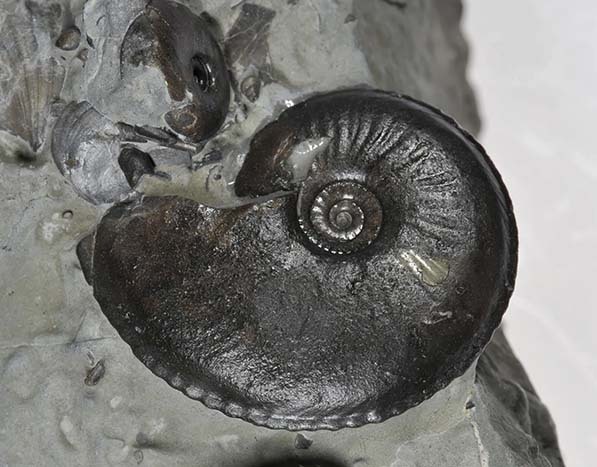 We´ll deal with the Pleuroceras genus later, so this article will be about the Amaltheus genus. In the middle lias of the Yorkshire coast, Amaltheus is not particularly rare, although nice specimen can be hard to come by. 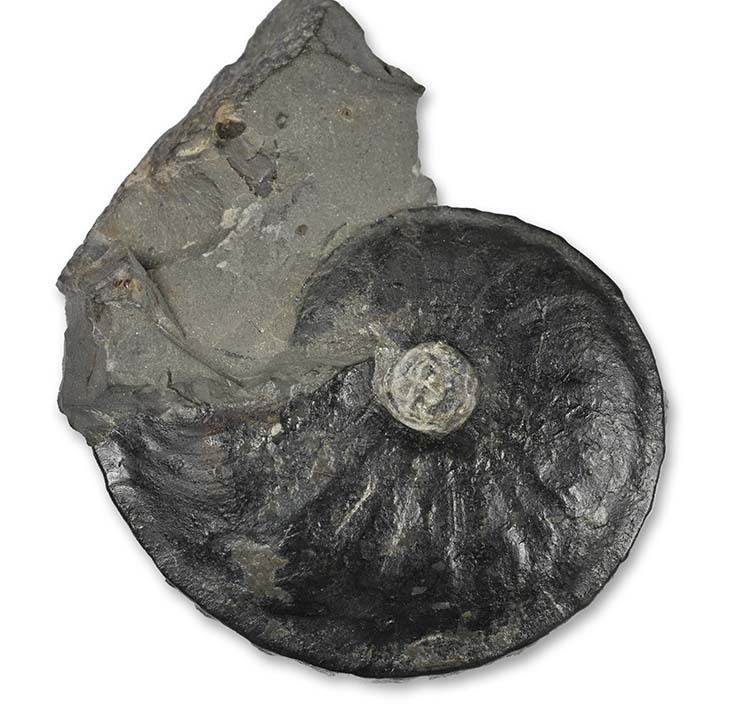 As with many Yorkshire ammonites from the various beds of the lias, the best preserved Amaltheus ammonites come from nodules. 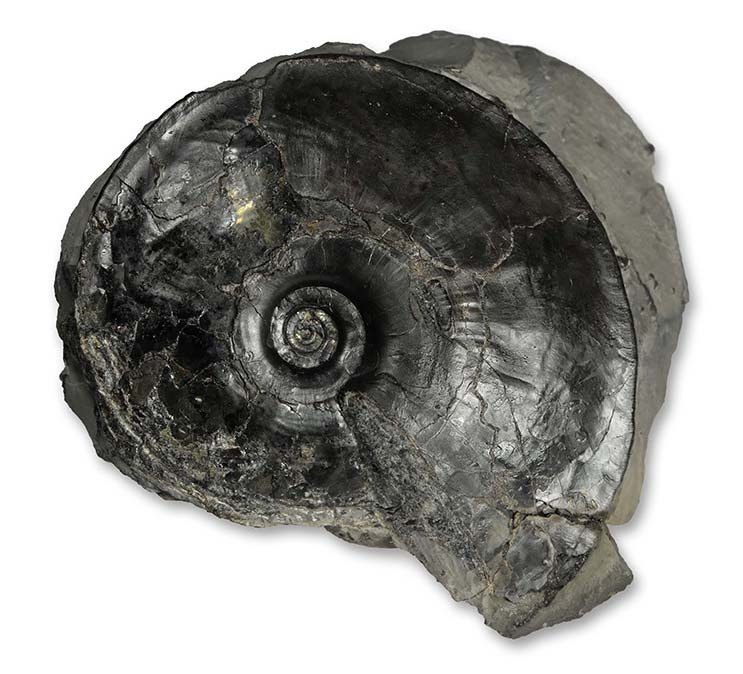 The first one, Amaltheus stokesi, is also the largest, I have found specimen up to 22 cm / 9″. The shown specimen is almost complete including the body chamber, there seems to be a predetermined breaking point (when eroding) between body chamber and phragmocone, because most specimen are found as just the phragmocone. It does often occur together with A. wertheri and A. bifurcus. Amaltheus wertheri in constrast is one of the smaller Amaltheus species, I´ve never seen specimen exceed 4 cm. It’s an almost smooth species with just a slight crenelation of the keel and a very pronounced constriction at the aperture. In the subnodosus subzone the species A. subnodosus is the naming index species. it’s got an inner whorl with strong ribs, each crowned with a little tubercle. Ribs stay strong on larger whorls, while tubercles fade away at around 2 to 3 cm. Strong keel. Amaltheus striatus starts similar to A. subnodosus, ribs & tubercles on the inner whorls are not as strong and fade away until at around 2-3 cm the shell becomes almost smooth apart from fine shallow ribs. Strong keel. Amaltheus bifurcus is a rarer Amaltheid from the stokesi subzone, occurring together with A. stokesi and A. wertheri. Similar to A. stokesi, but stronger ribbing at similar sizes, thicker whorls. 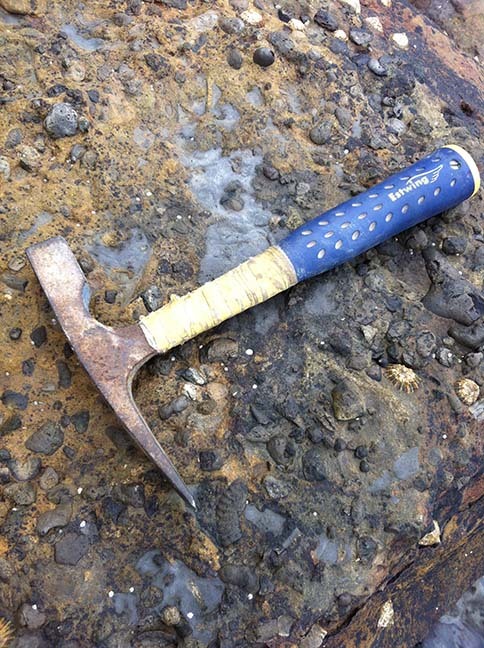 Usually specimen do not get much larger than 6-8 cm, I do have a very eroded (doubtful) specimen at about 10 cm. Amaltheus margaritatus is the index fossil of the margaritatus subzone. It does not overlap with A. stokesi, is seen as the direct descendant from A. stokesi and can grow to similar sizes. The more differentiated keel is the main difference between A. margaritatus and A. stokesi, but since the species do not overlap and the rocks they´re found in in Yorkshire are rather distinctive (ironstone nodules = A. margaritatus, grey limestone nodules = A. stokesi), mixing up of the two species ist almost impossible. It is often found together with A. subnodosus and A. striatus. Amaltheus laevigatus is almost smooth on the inner whorl and develops fine ribbing after about 1 cm. Rather rare, I’ve found only 1 specimen in more than 20 years. 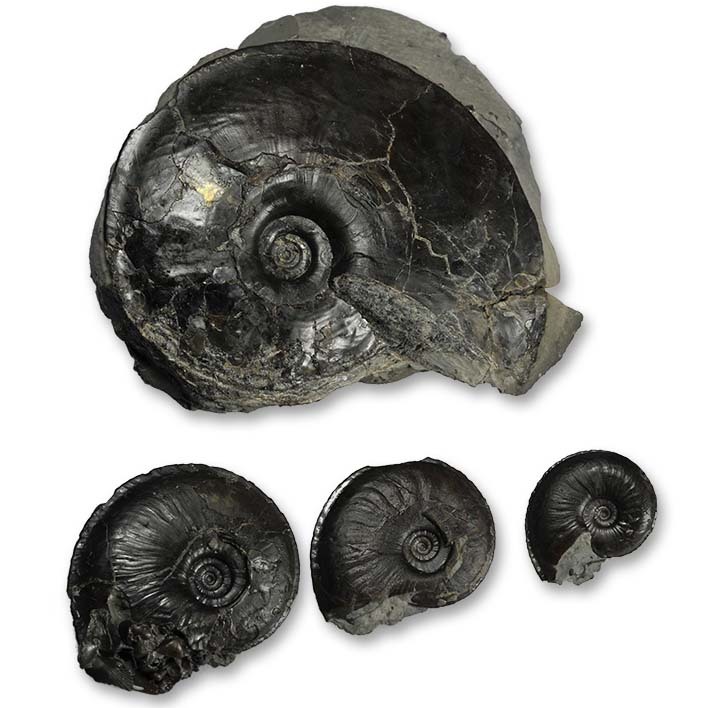 Amaltheus laevigatus, 2.5 cm, not a replica ! Amaltheus gibbosus is very rare in Yorkshire – I only have a specimen that I purchased from M. Marshall / M. Forster that came from Staithes. Both Amaltheus gloriosus and Amaltheus reticularis are apparently extremely rare (or I have not been looking in the right places) – I have not found a specimen of these. I do have a replica Amaltheus reticularis that I´ve shown you in a previous post. You might have wondered why I called the Oxynoticeras in one of the last posts Oxynoticeras simpsoni and not Oxynoticeras oxynotum. I did actually have that one labeled as O. oxynotum originally, more or less assuming that this was the more common species and not looking for the differences. I had only the large Oxynoticeras where you could not overlook it’s typical O. simpsoni characteristics labeled as such. So when I looked through my collection, I actually found that I had only one potential O. oxynotum, all the other ones were O. simpsoni, just different growth stages ! This picture shows the O. cf. 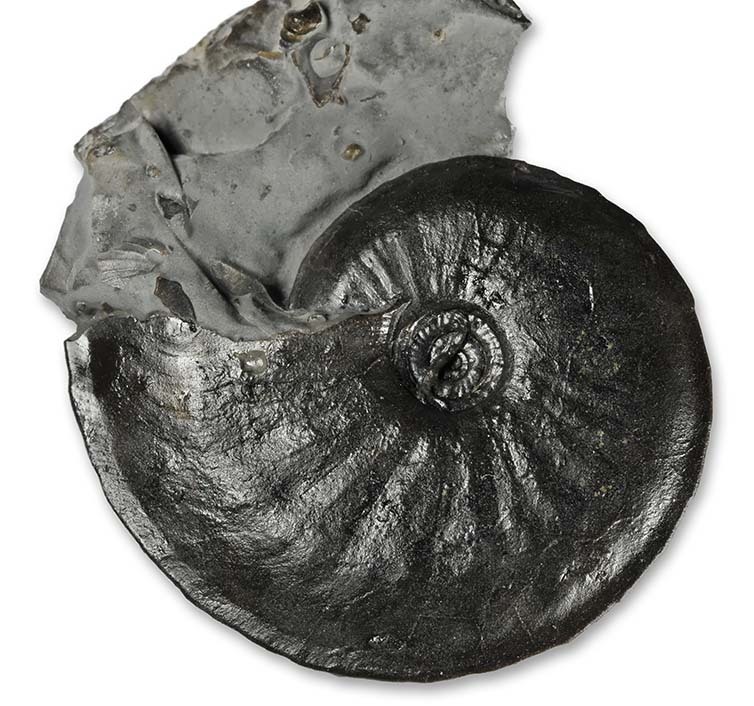 oxynotum , found in 1990, a lucky split, inner whorls as they could be prepped then (with a prep needle). Today I gave it a little re-prep with the air abrader, just a 5 min job. there is a bit of a soft wave-like ribbing that almost vanishes at the point where the ribs bend forward towards the keel, while O. simpsoni has a larger umbilicus, thicker whorls, and the whorl section thins out towards the venter, making it more lanceolate. O. simpsoni has very fine ribbing that continues towards the keel and can produce a crenelated keel. 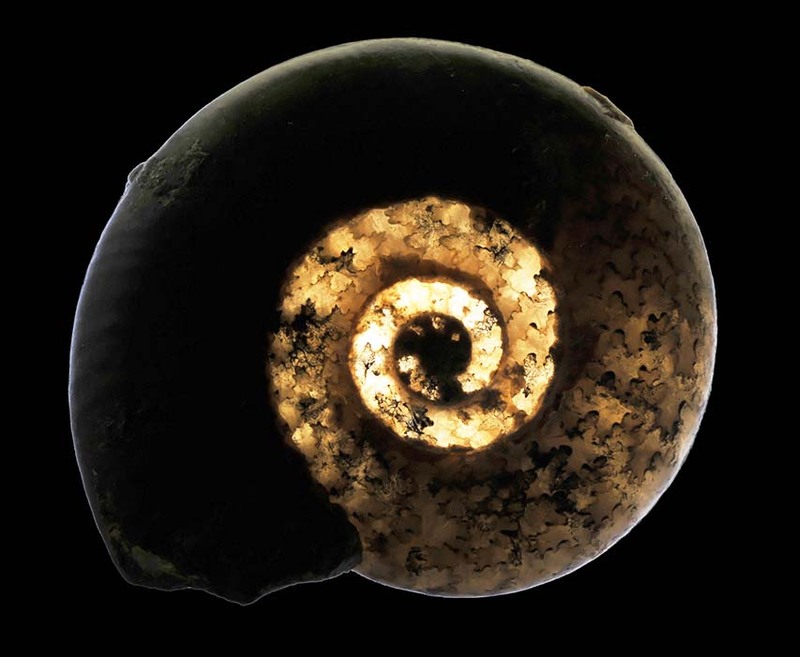 In comparable beds around the world, Oxynoticeras seems to be more common without shell, e.g. pyritized. I wonder if the authors describing the different species ever saw them with shell ? At small sizes, with the shell on, they´re almost identical. Both O. oxynotum and O. simpsoni apparently get very large : HOWARTH 2002 describes specimen between 25 and 40 cm ! As usual: If you do have a large specimen like that, let me know ! 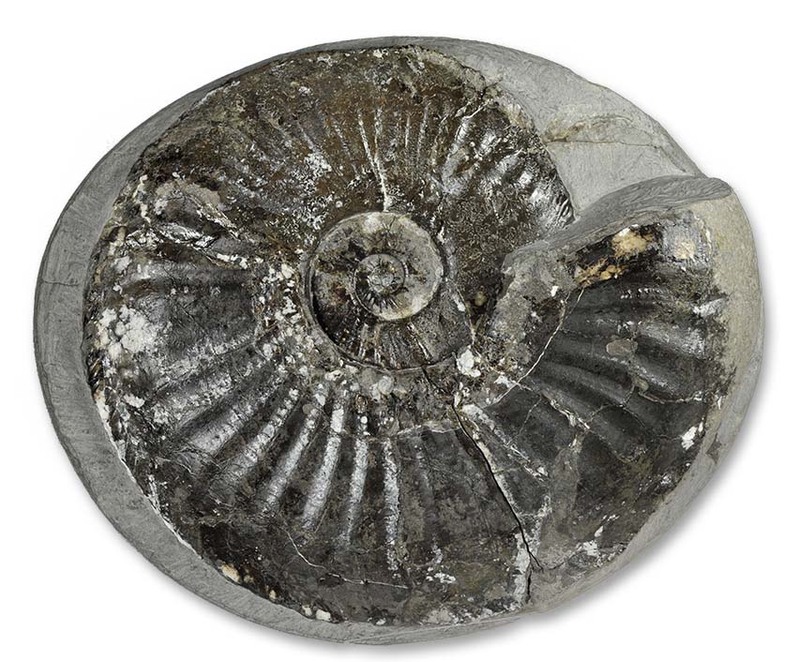 I have a small Oxynoticeras specimen with a crenelated keel – SCHLEGELMILCH lists this as a characteristic of another 2-3 cm small species O. bucki, which HOWARTH 2002 later lists as a synonym of O. simpsoni – I tend to agree with that, allthough since this one has its complete shell preserved, the other characteristic of O. bucki, as SCHLEGELMILCH describes it – a very simple suture – cannot be seen. 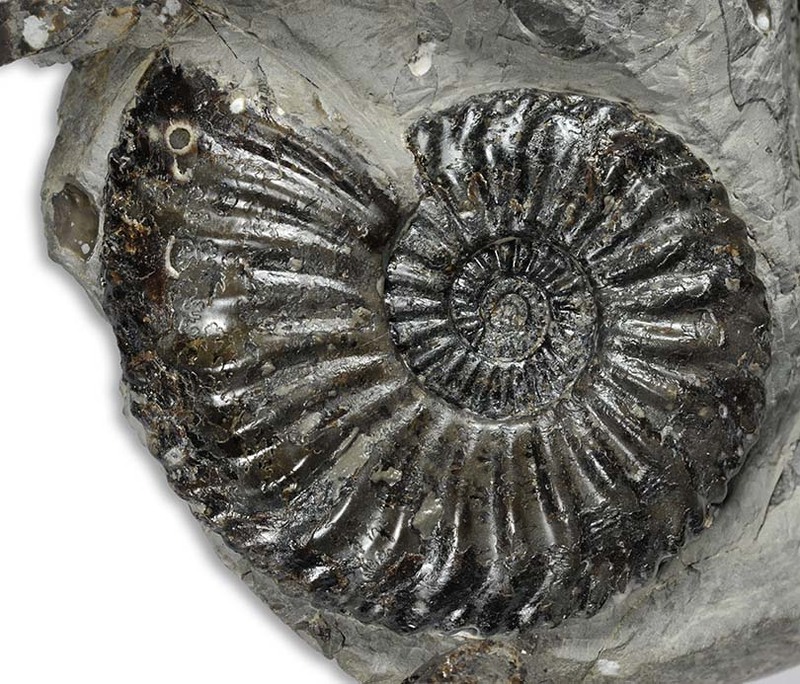 Who bit my ammonite ?